Prospector, captain, mayor, trader, settler, craftsman, or builder? Which roles will you play in the new world? 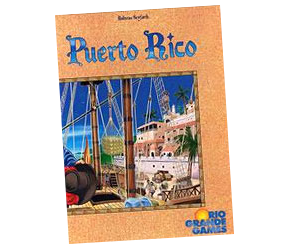 Famous holder of the #1 spot on BoardgameGeek for many years, the much-analyzed Puerto Rico is the jewel in the crown of so-called ‘Euro games’. It’s an entertaining challenge and the perfect introduction to something more complex and ‘gamey’ for new gamers. Though perhaps lacking a bit in the way of player interaction, no one can deny the mechanic of choosing new ‘roles’ each turn is brilliant. Players are merchants in the Renaissance-era New World colony of Puerto Rico, managing their plantations of corn, indigo, sugar, coffee and tobacco, expanding their cities, and shipping the goods back to the Old World. Colonists—well, historically, slaves really, but the game avoids the unpleasant realities—work your plantations, but your goods can only be produced if you have the appropriate production buildings in the city and colonists working in them. You earn victory points by ultimately selling goods back to the Old World (and constructing ever-more elaborate buildings). If you think role selection, you probably first think of this game. Each turn, players can choose from a number of roles: the Captain, Trader, Prospector, Settler, Builder, Mayor or the Craftsman. Each of these has a certain game action associated with it which all players then perform—but the person who chose the role gets and extra advantage. For example, if you choose the Mayor, everyone receives colonists from the colonist ship to work your plantations and populate your buildings. However, as the player who chose the role of Mayor, you receive one extra colonist from the general supply. In addition, at the end of the round when everyone has chosen a role, you place one gold on the other roles—thus making these roles more attractive for subsequent selection. Puerto Rico is relatively complex, especially to newer gamers unused to these kind of mechanics, but it also has the ability to rope in and engage player of all levels of experience. Once everyone has got the hang of it after a few turns, it flows smoothly and offers lots of interesting choices that have to be balanced carefully. Because it is so popular it has attracted a lot of criticism and detailed analysis, but first and foremost it is a fun and interesting game that deserves a place in every gamer’s collection. It’s only a shame that it continues to be a slightly drab experience from a graphic design perspective—it’s certainly a game that deserves a brand new deluxe edition. I love your work, thank you for the outstanding reference sheets. Thanks for spotting that – fixed! Thanks for all the hard work! Very useful! There seems to be two copies of the last page, with the order of University and Factory exchanged! Sorry, I see the explanation on the first page.